At the Massachusetts Bar Foundation’s recent Annual Meeting, Attorney Susan M. Finegan, who as chair of Mintz’s Pro Bono Committee leads groundbreaking cases and manages pro bono matters for the firm, was honored with the Great Friend of Justice Award. Over 140 MBF Fellows, grantees and friends attended the event, held on March 5, at the Federal Reserve Building in Boston. The MBF’s Great Friend of Justice Award is presented annually to an individual who has demonstrated extraordinary commitment to justice, consistent with the MBF’s values and mission of increasing access to justice in the state. Sue Finegan’s commitment and dedication to access to justice exemplifies the spirit of this award. Finegan is a nationally recognized pro bono pioneer with a passion for helping underserved. She helped to defeat President Trump’s first immigration travel ban in early 2017, to engineer the passage of a Massachusetts restraining order law for sexual assault survivors, and to create several innovative statewide model pro bono programs in Massachusetts. As member and current co-chair of the Massachusetts Access to Justice Commission for several years, Sue has been a tireless and innovative advocate for low income people in Massachusetts and beyond. She has spearheaded creative funding mechanisms to support legal aid organizations and developed the statewide civil appellate pro bono program for self-represented litigants. Five years ago, she co-founded the Access to Justice Fellows program, in which over 100 retired and retiring lawyers have devoted over 70,000 pro bono hours at legal services organizations, nonprofits, and the courts. Also at the event, the MBF honored fifteen lawyers and judges who recently completed philanthropic pledges to the MBF Society of Fellows, and listened to remarks by MBF grant recipient Alexandra Peredo Carroll, interim managing attorney for Kids in Need of Defense (KIND), who shared about her work assisting unaccompanied immigrant children. The Massachusetts Bar Foundation (MBF) recently hosted two receptions, in Boston and Springfield, to celebrate and honor its current grant recipients and recognize leading supporters of the foundation. MBF donors, friends, and representatives from many of the 90 programs currently funded by the MBF were in attendance. This year, the MBF awarded $2.3 million in grants through its annual Interest on Lawyers’ Trust Accounts (IOLTA) Grants Program. These programs help thousands of individuals and families in Massachusetts who have legal issues relating to domestic violence, housing, access to special education services, healthcare, discrimination, and many more. Anna Richardson, Esq., co-director and chief counsel of Veteran’s Legal Services, and Nora Grais-Clements, Esq., staff attorney at the Victim Rights Law Center and former MBF Legal Intern Fellowship recipient, served as this year’s grantee speakers. 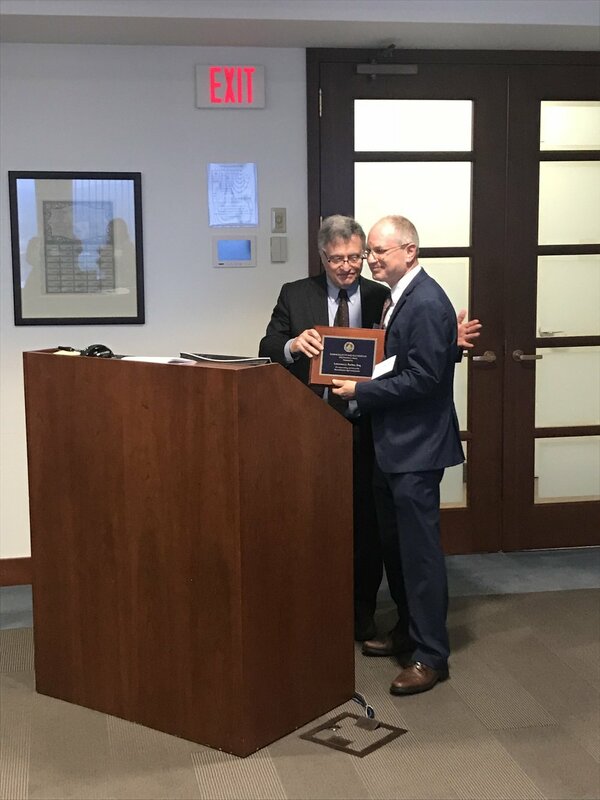 Also at the receptions, the MBF presented President’s Awards to Albert Zabin, Esq., of Greater Boston Legal Services in Boston, and to Larry Farber, of Farber and Lindley in Amherst. Given annually, the MBF President’s Award recognizes exceptional MBF supporters for their commitment to increasing access to justice for the most vulnerable in our state. At the Boston reception, which was held at the Mass. Bar Association, MBF President Harvey Weiner, of Peabody & Arnold, highlighted Zabin’s extensive pro bono work and long-time support and dedication to the mission and work of the MBF. Zabin has volunteered to serve on MBF grant application review committees for more than twenty years. Following his retirement after 54 years of private practice, Zabin began volunteering as a staff attorney at Greater Boston Legal Services. At the Springfield reception, which was held at Bulkley Richardson, both Weiner and MBF Trustee Hon. Robert Fields lauded Farber’s many years of service to the MBF, including service on the Board of Trustees, as well as on the MBF grant application review committee for the region. They also applauded his long career as a housing attorney practicing in Western Mass. The Massachusetts Bar Foundation (MBF) recently awarded over $2.3 million to 90 programs conducted by 60 different nonprofit organizations through its annual IOLTA grants program. MBF IOLTA grants support projects that either offer civil legal services to people who could not afford them, or improve the administration of justice in the Commonwealth. Grants providing direct legal services include support to domestic violence programs, special education advocacy, humanitarian immigration assistance, and homelessness prevention. Grants to improve the administration of justice support efforts such as court-connected mediation and lawyer of the day programs. The Massachusetts Bar Foundation is one of three charitable entities in Massachusetts that distributes funds from the Massachusetts Supreme Judicial Court’s Interest on Lawyers’ Trust Accounts Program. Additional information about the Massachusetts Bar Foundation and its IOLTA Grants Program, as well as a complete listing of the 2018/2019 IOLTA grant recipients is available here. The MBF Trustees proudly announce the award recipients of the 2018 MBF Legal Intern Fellowship Program (LIFP). This year, the program will provide four exemplary law students with a stipend of $6,000 each for a full-time, summer internship at a Massachusetts organization providing civil legal services to the poor. The MBF’s Legal Intern Fellowship Program has two concurrent goals: to give talented students the experience and encouragement they need to pursue careers in the public interest law sector and to provide legal aid organizations with much-needed additional staff capacity for the summer. These awards are supported by generous contributions to the MBF from lawyers and judges statewide. "Though saddening to see clients walk in the door with a seemingly insurmountable number of problems, both legal and non-legal, it was even more inspiring to see the positive change in their situations after the attorneys at MWLS got involved," said Romanow. During her twelve weeks at the ACLU, Saltzman worked on a variety of cases and issues, including criminal justice reform, free speech, and raising public awareness of the importance of District Attorneys. Saltzman will use the valuable experience she gained during her internship to pursue a career that focuses on criminal justice reform. "MacKenzie built upon her existing strong knowledge of the SNAP program to advise several clients on SNAP eligibility, and in one of these cases, she developed and wrote a request for retroactive SNAP benefits of nearly $2,000 for a client who was wrongfully denied in the past," said Speer’s supervisor, Attorney Lizbeth Ginsburg of the Welfare Law Unit at GBLS. Having grown up in a family who originally emigrated from Japan, Sugino developed a passion early on for helping families with immigrant rights issues to ensure they didn’t struggle in the same ways her family had. Sugino chose to intern at KIND both to gain relevant experience and to help vulnerable unaccompanied minors. The immigration turmoil regarding family separations beginning in May, and coinciding with Sugino’s internship only strengthened her commitment to a career in this area.